Somalia is facing its worst drought for at least a decade, says the UN. Satellite surveys of rainfall and ground research show the drought’s severity, said UN humanitarian co-ordinator for Somalia, Mark Bowden. He said many cattle were dying from the lack of water, and that this was contributing to nearly half the population suffering from malnutrition. Mr Bowden said humanitarian assistance to Somalia needed to start “increasing dramatically”. He said that Somalis were not currently dying of starvation but some 3.2 million of the population needed life-saving food assistance. “We’re now facing a drought in Somalia that is worse than people have seen for at least a decade,” Mr Bowden said. 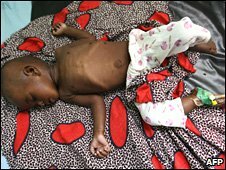 In parts of central and southern Somalia, 24% of children under five suffer from acute malnutrition, he told a news briefing in Geneva. Some 1.1 million people in Somalia have been driven from their homes because of conflict in recent years. Since the weekend thousands of civilians have fled fierce fighting in the capital Mogadishu between Islamist militants and the government.